What Are the 10 Most Important Advantages of Garden Houses ( Part -II)? In the first part we spoke about the different types of usage for a garden log cabin, the environmental friendliness of timber as a building material and how it reduces the carbon footprint, that it is processed nearby the place where it is harvested, the selection of garden log cabins on the Internet, as well as the advantages that you can get when you develop a garden log cabin into a living space that can be used as a year-round living space. Here in the second part, we will talk about the quality of life, aspects of the garden architecture, the advantages of an additional storage room, the possibilities to design a wooden garden log cabin, and finally also the costs. 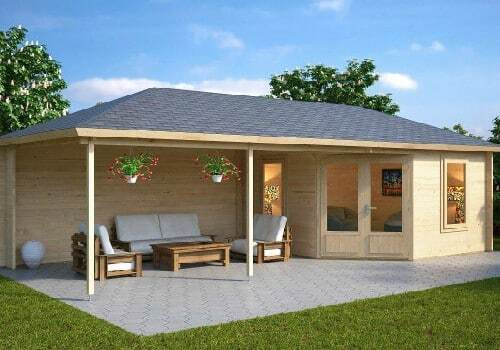 A garden log cabin could be enlarged at any time, storage sheds can be added, the wooden terrace or the roof overhangs can be extended, a high bed installed, a storage room set up, a view tower integrated and much more. No other building material is as familiar to most handicrafts men as timber. This individual work which you can do by yourself not only saves money in the creation of living and working space, but also is fun and can become a regular hobby. Once the set of tools is set up for carpentry, there is no limit to creativity. From bird houses to raised beds in the garden to carports or canopies: you can build almost anything from wood. A garden log cabin by a manufacturer is delivered and built within a few days. In the vast majority of cases, you can have the garden house dismantled and sold just the reverse way you set it up once you no longer need it. There is even a regular market for used garden log cabins. In addition to the expansion of your options and the increase in the quality of life, such a garden log cabin also offers a good financial investment. If you are building a dry foundation, maintain the ventilation of all parts, and treat the parts that regularly get wet with oil or glaze to shield them against the weather, a garden log cabin can get extremely old. This is especially true if you choose Nordic conifer with wall thicknesses of 4cm or above as your building material. You can sell it or inherit it to your children. On the property market, a garden log cabin on the property can increase the value by up to 7%. For your marriage or partnership a retreat in the garden with a sleeping accommodation can be very comforting at times. When the relationship goes through a crisis, a night in separate bedrooms will make both partners think again. And also children in their puberty are grateful for their own little realm where they can train their independence without the big final separation from their parents’. Which ever way you would want to use a garden log cabin fitted for habitation. The choices are all yours! Whether you have furniture in the house that you do not want to throw away or if your house is already bursting at the seams: A garden log cabin always offers a very welcomed place to keep things dry and safe and extend their lifespan this way. Bikes, toys, books, suitcases, garden furniture, your surfboard, or a mattress. Everything that will relieve your house and create free space is welcome and the garden log cabin offers a safe place to store your valuable things . A garden log cabin makes the whole garden look more or less inhabited and cultivated. You may be amazed noticing how often you will enjoy the view of your garden log cabin during your tour of the garden and enjoy taking a short break on its terrace. Particularly beautiful are hecta- or octagonal garden pavilions, which decorate the garden with large window areas, subdivided by many mullions and romantic pyramid roofs. Many garden owners integrate their garden log cabin very successfully into their landscaped gardens and give them a frame of ornamental ponds, flowers and shading trees in the background. There are many ways to make your garden log cabin a piece of jewellery that you can proudly present to your friends and visitors. With a garden log cabin you create living-, storage- and working space with very low costs if you compare it with how much you need to spend when you construct a stone house of the same size. The statistic requirements for foundation and substructures are not high due to the low weight, the required functions are comparatively simpler and not as complicated as with stone buildings and the short construction period is a factor which not only contributes to your comfort but also helps to spare costs. Finally, the usual interior design with plaster, wallpaper, drywall or wood panels are as unnecessary as the waiting time for the building to lose moisture and the smell of concrete. However you use your garden house, it will offer options, expand your circle of impact, support your development and that of your family and friends, give your garden a new meaning and, in general, increase the quality of life like hardly anything else could.